Travis has been in the hair industry for over 20 years and is a precision cutter and seasoned colorist. However, his favorite (and most frequent) service that he provides at Citrine is the Goldwell Kerasilk Smoothing treatment. Fortified with silk proteins and jojoba oil, the Goldwell Keratin Kerasilk treatment smooths out the hair cuticle; leaving soft, shiny and manageable hair with little to no effort. This smoothing treatment lasts 3-5 months (depending on lifestyle). We asked Travis which products he would recommend to help maintain the treatment at home. "My favorite products are the Goldwell Kerasilk Control shampoo combined with the Control smoothing mask as your conditioner. When combined, these two products help reinforce the Kerasilk treatment and also help it last longer as these products have actual Keratin in them." Travis understands how hard it can be to have coarse, or unruly hair and strongly trusts in the Kerasilk system. With year round frizz management, the Smoothing treatment is ideal for the high humidity North Carolina summer months. Our favorite time of the year is finally here- the season for celebration and giving thanks! In the quest to spread cheer and love this holiday season, many of us will compile a long list of relatives and close friends that we'll spend the coming weeks searching for the perfect gift for. The holiday season is full of memories and traditions, but busyness and stress often precedes any signs of joy. Consolidate your to-do list this year by stocking up on hair and skincare sets- ideal for the beauty buff and mane-obsessed people in your life (who wouldn't love the gift of great hair, anyway?). This year we've picked up gift sets from Davines, Goldwell, Bumble and bumble, and Eminence! You'll find the perfect gift for anybody, with a variety of box sets catered specifically to various hair and skin types. Best of all, these gift sets are discounted with a 15%+ savings, and come beautifully packaged and wrapped. Save yourself some time and stress this year and pick up some of the following treasures! "A blend of six featherlight oils helps soften, silken, tame, de-frizz, detangle, and protect against breakage– without weighing hair down." Valued at 66 dollars, this set is just 39 dollars! "This lightweight shampoo instantly preps hair for airy, voluminous styles." Valued at 53 dollars, this set is being sold for 29 dollars! We can barely contain our excitement right now- the hugely popular skin care line, Eminence, is coming to Citrine Salon! Founded in Hungary in 1958, Eminence strives to craft the highest quality organic skin and beauty products. The principles that Eminence was founded on align perfectly with ours- those of sustainability and a responsibility to the Earth. All Eminence products are USDA and Hungarian Certified Organic, and are "proudly free of parabens, animal by-products, propylene-glycol, sodium lauryl-sulfates, harmful colorants and fragrances, mineral oils, petroleum, and other harsh cosmetic chemicals." Our aesthetician, Bhavna, will be using exclusive Eminence skin care products for all of her facial and skincare services. She is knowledgeable and up-to-date on the entirety of the line and is our go-to Eminence guru. If you love any of the products Bhavna uses during your visit with her, or already use Eminence products, they will be available for purchase in the salon as well! If you haven't tried Eminence before, you're in for a treat. Everything is handmade, produced "without any severe heating or hydrogenating processes that can affect the nutritional content and potency of natural ingredients. Vitamins are captured in their all-natural fresh base, offering dramatic results as actual seeds, pulps and peels impart regenerative and healing powers that only nature can produce." Eminence crafts cleansers, toniques, exfoliants, masques, moisturizers, sun care, and lip & eye care that is customized and catered directly to your skin type and needs. Premium ingredients are sourced from around the world, however the majority of them are grown and hand-picked in Hungary and North America. Eminence is involved in numerous charities and contributes to multiple foundations around the world. We love their commitment to the environment, and look forward to building a relationship with them in the coming years. Eminence is regularly praised and sworn by celebrities, and has received attention and numerous awards from global magazines and networks. Call us if you have any questions about the line, we'd love to hear from you. And as always, call, email, or stop in to schedule a facial with Bhavna. source: Eminence main website, May 2017. Just in Time For Summer: Bb's NEW Don't Blow It! Sometimes achieving that effortless, air-dried hair style can be easier said than done. As the trend for natural and low-maintenance hair styling continues to become more popular, finding the right method to style hair without all the work can be challenging. We all want to have great hair, but don't want to put in the work for it, right? And why use heat and product just to make it look like you didn't use heat and product? If the effortless 'do is what you're going for, it should go without saying that little to no effort is required. So what can you do to decrease the time spent getting the perfect style? Bumble and bumble released Don't Blow It in 2014- made specifically for fine hair in need of texture and body. This styling creme is super versatile- meant to be worked into towel-dried hair and styled whichever way you like. Scrunch your hair, twist in some curls, or work your fingers through for easy texture and lots of body. Three years later, Bumble invents Don't Blow It for thick hair, and the hair gods rejoice. Arriving at Citrine just in time for summer, Don't Blow It will give your blow dryer a rest for the summer season. Made for medium to thick hair, Don't Blow It conditions hair while reducing frizz. Giving you the perfect amount of control, Don't Blow It refines and defines with little effort. Work a small amount from mid-shaft of the hair to the ends. Let air-dry, and go! Seriously, though, could getting the perfect style be any easier? Give your blow dryer a break this summer! Stop in to give Don't Blow It a try. Both cremes offer UV protection- perfect for the days spent outside in the sun. These lightweight stylers are ideal for summer- great hair days with no heat or hassle. April is Beauty Sustainability Month! Citrine was founded on sustainable and eco-friendly principles back in 2009. We love the planet we call home!, and we do everything we can to reduce our impact on the environment. Our location here at East 54 in Chapel Hill is an environmentally-friendly LEED certified development. The salon relies on low-energy lighting and tons of natural sunlight. We follow procedures that involve all earth-friendly cleaning products, maintain a completely paperless booking and transaction system, and recycle goods and waste wherever and whenever we can. We believe that living a green lifestyle does not have to entail going without! Aside from the larger measures taken to reduce our carbon footprint, we wondered what else we could do to promote an eco-friendly hair regimen and lifestyle. What ways could our staff and clientele take advantage of the perks of sustainable beauty? After all, it is the smaller, more gradual changes in life that have substantial, lasting impacts. We are a proud carrier of Davines hair and Comfort Zone skincare products. Davines (and Comfort Zone) is an Italian-based hair care brand focusing on customized hair products that are eco-friendly in as many ways possible. The unique packaging Davines has designed is a case in point! Their shampoo and conditioner containers are reusable, and serve multiple purposes other than holding your favorite hair product. These containers are produced using as little already-recycled plastic as possible! After the product inside is gone, and the container is cleaned, it is food-safe! A popular use for conditioner containers is to store and carry food and snacks. Our personal favorite use of these empty Davines containers is repurposing them as planters. They serve as the perfect sized planter for smaller seedlings and plants. Our succulents here at the salon have a great home in their repurposed conditioner containers and are thriving! Not all of us have a green thumb, though. For those that still love the sustainable concept of Davines, we're offering a promotion when you bring in your clean (full size!) shampoo and conditioner containers. We'll refill your product and top it off with a 10% discount. It's just another way to achieve beautiful hair in the most sustainable way possible. If you love a Davines shampoo and/or conditioner, also consider ordering a liter size of your favorite product. Shopping in bulk greatly reduces the amount of waste created, and you save money! We can order many of our best-selling Davines products in larger sizes, and they're shipped to us immediately. Often times, it's the small efforts and changes we make in our day-to-day lives that have the biggest impact. Striking a balance between beauty and sustainability can be challenging, but the results improve our lives and the world around us. As we celebrate Beauty Sustainability Month and Earth Day in April, consider what ways you can reduce your impact on the planet and how your health and beauty habits affect yourself and the world we live in. Stop in this month to check out our Davines line and get inspiration on how you can be sustainably beautiful! We've fallen in love with Bumble and bumble's Hairdresser's Invisible Oil line here at the salon. Not only are we seeing great results from the shampoo and conditioner, but the balm-to-oil masque and invisible oil spray are getting some of our clients through these dry winter months. For others, frizz and dehydration are always a concern, no matter what time of year. For those of us with dry to very dry hair types, continually stripping the hair of natural oils can result in a style that makes for more maintenance and trouble, not to mention the risk of damage and breakage. And it can be hard to find a shampoo that cleans the hair but is gentle enough to retain moisture. Regardless of the weather and outside influences, dull and frizzy hair is no fun anyway! Bumble and bumble is introducing a new addition to the Hairdresser's family, and it's sure to be a hit among the salon and our clients. The Hairdresser's Invisible Oil Cleansing Oil-Creme Duo is meant to be used in conjunction with the Hairdresser's Invisible Oil shampoo and conditioner. Use it in place of your Hairdresser's shampoo every other day, and follow with the Hairdresser's conditioner like you normally would. It's that easy. One of our favorite things about this new Bumble product is (like always) the packaging! A low-foam cleanser and luxurious moisturizing creme housed in dual-chambers combine to gently eliminate dirt and build-up while preserving your hair's natural oils. Like the rest of the Hairdresser's products, the Cleansing Oil-Creme Duo contains six signature oils that deeply moisturize and condition all hair types. Over time, the added moisture will further silken and protect your tresses. It's a simple addition to your regular washing routine, but with all the extra benefits you never knew you needed! Bumble and bumble Introduces Strong Finish! The Firm Hold Hairspray! This week Bumble and bumble introduced a new hairspray to the bumble family. Strong Finish is "an extra-firm, no-slip spray that keeps styles up all night (and day)"! Formulated with new Strong Hold System technology, Strong Finish is sure to keep your fresh style in place. Bumble and bumble will be replacing it's Classic Hairspray with Strong Finish, as it will be the strongest hold Bb Hairspray. It will be the perfect touch to your daily hair routine, updo, or coif- locking your style in for up to 8 hours. Additionally, like all Bumble hairsprays, you can brush through Strong Finish without any flaking, however it will break down the Strong Hold System technology. Strong Finish sprays evenly, and has a light airy smell. We cannot wait to see how our clients like Strong Finish! Our stylists are already getting positive feedback on the spray, and we are selling it in a large 10 oz size or smaller 2.7 oz travel size (TSA approved)! Whatever style or hold you are looking to achieve, Bumble and bumble has a hairspray that will suit your needs! The newest additions to the Hairdresser's Invisible Oil Family! Delivering instant shine and softness without weighing your hair down, the new Bumble and bumble Hairdresser's Dry Oil Finishing Spray! Perfect for going out in the sun, with a built-in UV protectant, so your hair stays healthy. You can take it anywhere and use it for days without build up. Just shake well and spray mid strands to end, and comb through with your fingers or comb. It's just that simple! Bumble and bumble Hairdresser's Dry Oil Finishing Spray also tames frizz, while conditioning your hair. This lightweight mist is formulated for hair that needs extra moisture and shine. Bb's Hairdresser's Invisible Oil Balm-to-Oil Pre-Shampoo masque is a silky cream that liquefies in your hands before applying to dry hair. It is key to warm the product up before putting the masque on! It's at this time that Coconut Oil, Argan Oil, Macadamia Nut Oil, Sweet Almond Oil, Safflower Seed Oil, and Grapeseed Oil are activated, and will make your strands softer and smoother! Because hair is more absorbent when it is dry, leaving the masque in for 20 minutes is important. After washing out, we recommend to follow up with the Hairdresser's Invisible Oil Sulfate Free Shampoo and Conditioner. Best of all, the pre-shampoo masque is safe to use weekly, and will keep your hair soft and shiny. Stop in to Citrine to pick up a sample of the Pre-Shampoo Masque and the Hairdresser's Invisible Oil! We are excited to see that a few products we carry here at the salon have been featured in the 2015 Allure Best of Beauty Awards! 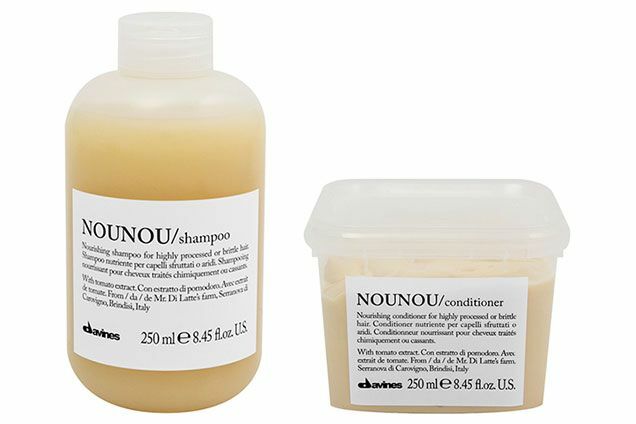 Nounou is a product by Davines that is ideal for bleached, colored or highlighted hair. The NouNou formula was designed to deeply nourishes your hair while giving it immense amounts of body and volume! This product restores and rehydrates leaving your hair feeling nourished and looking illuminated. So ladies say good-bye to flat, dry or limp hair ladies ! Bumble&Bumble Surf Infusion combines salt water and oil... Brilliant... but then again we would expect nothing less from such a great product! This product leaves you with the "beach hair" you are looking for with a glossy finish ! Just shake and spray its as simple as that! This first-of-its-kind oil-infused salt spray won the award for Best Wave Enhancer !